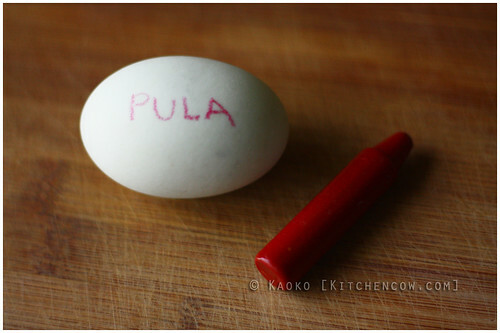 Growing up, salted duck eggs or itlog na pula (red eggs) would make a common appearance on our dining table. We’d cut it up and throw it in with some diced tomatoes as a side dish for fried dishes, or as a main when I was being a stubborn picky eater who would refuse to eat what was on the table. Ah, those were the days. First attempt. Not as oily as I’d like. The later ones nailed it. Salted duck eggs are duck eggs that have been brined for a couple of weeks before being boiled. 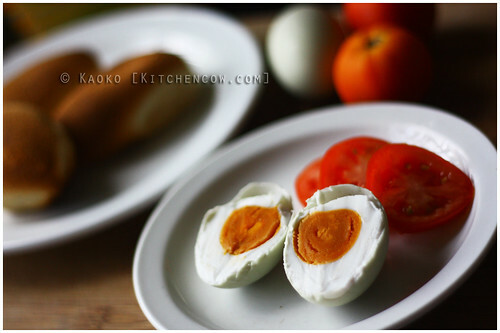 When sliced, the yolk would have a deep orange sheen. If it was a particularly good egg, you’d be rewarded with a bright oily sheen seeping from the yolk. Just the thought of oily salted duck eggs would be enough to make my mouth water. 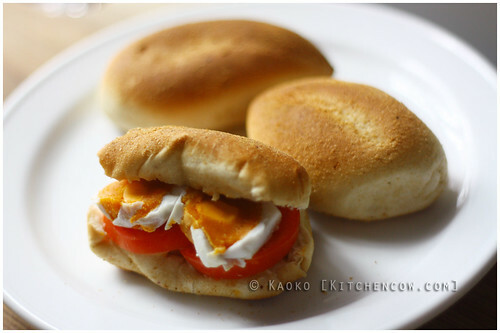 Perfect merienda! Also works as panini. Back then, they were called itlog na pula because they’d be colored with a red dye before being sold. These days, uncolored salted duck eggs have become common, because really, the red was just to differentiate it from the other eggs in the store. It didn’t really make a difference to the taste. Itlog na Pula. Har de har har. Usually, we buy our salted duck eggs, but whenever we’re gifted with fresh duck eggs, I can’t help but make our own, just because I can. Sure, it’s more cumbersome, but the satisfaction I get from slicing open a salted duck egg and seeing the precious oily yolk and the knowledge that I made that is reward enough. It’s best to start with fresh salted duck eggs. You can tell that an egg is fresh if it sinks when submerged in a container of water. If it floats, it means that a large air pocket has already formed, mostly due to age. Gently wash the eggs to remove any dirt sticking to it. The ratio I use is 4 parts water to 1 part salt. 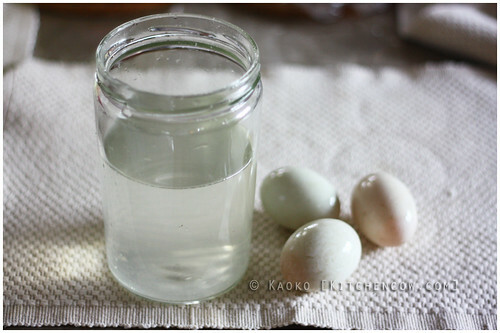 Pick a large glass container, one that can comfortably fill all the eggs you plan to brine. Stick the eggs in, add water to fill it to the brim, then pluck the eggs out. Measure the leftover water. I do this to give myself an estimate of how much brine I need. From there, I measure out salt, roughly one part to four parts of water. I shake it well until the salt is dissolved. Some people recommend boiling the water to dissolve the salt better. You can do that. But remember to cool the water down to room temperature before proceeding, otherwise, you’ll cook your eggs. Yeah, time to bring the mason jars out. Place the eggs back in the jar. Make sure it’s covered with enough salt water. Chances are, it will float because of the salt. Use something to weigh it down. A small teacup. A bag of stones. A sealed plastic bag filled with water works too. Just make sure that the eggs are well below the water line. Cover the jar and keep it undisturbed in a cool place for two to three weeks. I usually go the full three weeks, but some people recommend testing the eggs for saltiness a few days after two weeks. Either way, just boil one egg to find out if it’s salty enough for you. If it’s not, wait a few more days. Look around the house for something to weigh it down. Here’s the magical part that puts the oily sheen in your egg yolks. Gather your eggs and place them in a large pot. Fill it with enough fresh water, covering the eggs up to at least an inch. Gently bring it to boil, then simmer over the lowest heat you can get. Keep it simmering for 30 minutes. Wipe dry then store in the fridge or a cool place. It keeps for a few weeks, perhaps a month or so. Congratulations. 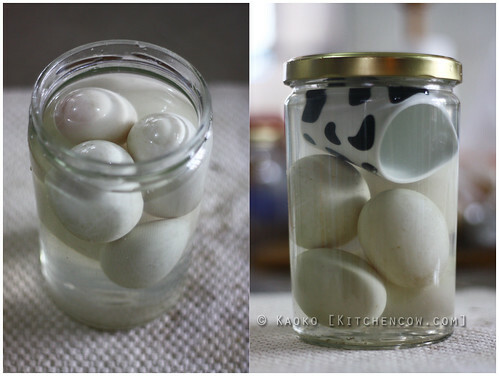 You’ve made salted duck eggs. These babies will be perfect with tomatoes, as a part of lato (sea grapes) salad, pako (fiddlehead fern) salad, as part of the sauce for salted duck egg shrimp, and as palaman (filling) for hot pandesal. 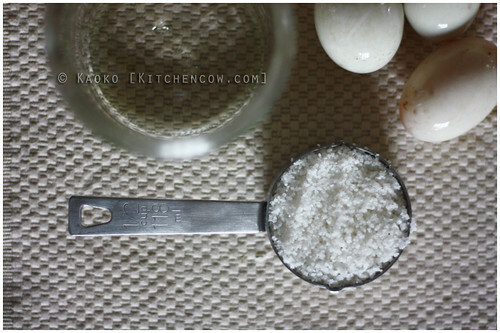 What are your favorite uses for salted duck eggs? This entry was posted in food & cooking, recipes. Bookmark the permalink.